Compact, evergreen shrub that performs well, either as a small specimen plant or part of a mixed border. 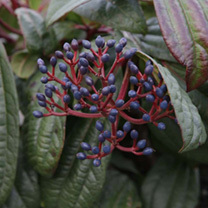 Grown mainly for its attractive leaves, with distinctly marked veining, and reddish-coloured stems. Small, rather insignificant, white flowers are produced during May-June. RHS Award of Garden Merit winner. Height 50-60cm. Supplied in a 7.5-10 litre pot. Compact, evergreen shrub that performs well, either as a small specimen plant or part of a mixed border. Grown mainly for its attractive leaves, with distinctly marked veining, and reddish-coloured stems. Small, rather insignificant, white flowers are produced during May-June. RHS Award of Garden Merit winner. Height 50-60cm. Supplied in a 3 litre pot or 7.5-10 litre pot.